Hello everyone, welcome. 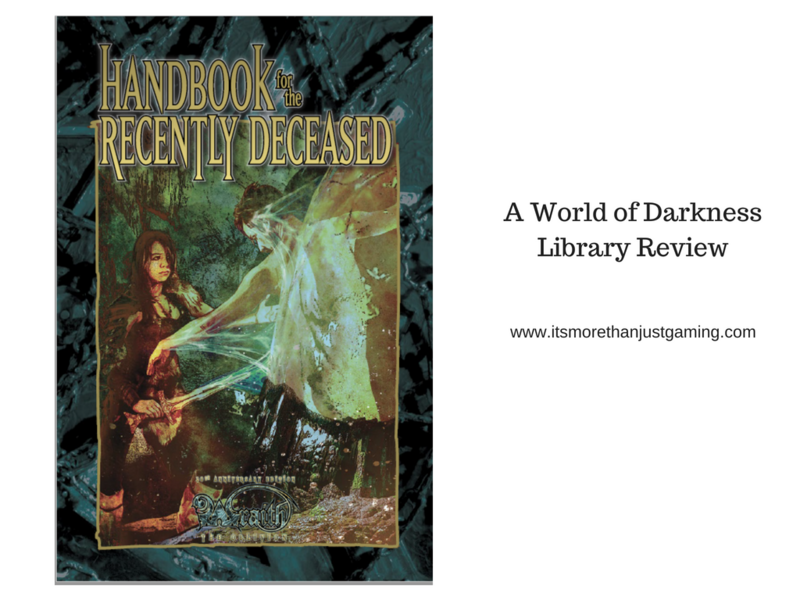 It feels like a while since I did a review of a World of Darkness Product that wasn’t Storytellers Vault, but here I am today, doing exactly that. In this case it is the Wraith 20: Handbook for the Recently Deceased. This product was a free PDF on the website Drive Thru RPG (Banner at the bottom of this post), though you can pay for a physical copy. Wraith: The Oblivion is the World of Darkness game line I have the least familiarity with as all the others deal with characters in the land of the living, whilst Wraith is about Ghosts. In a bout of shortsighted thinking I decided there wasn’t much crossover between ghosts and vampires and werewolves, so when I started running games, Wraiths didn’t feature at all. And certainly you can run one of those games without ever touching the other lines but World of Darkness has been designed so that all game lines intersect. I recently had the opportunity to play a basic game of Wraith: The Oblivion (You can read about that HERE) and despite it not dealing with Wraith Politics or the expanded world, I thoroughly enjoyed it. Wraith: The Oblivion is currently due for a release of its 20th Anniversary edition, this work only preceded by Wraith 20: Handbook for the Recently Deceased. I found the title amusing as I am sure it is the title of the book Geena Davis and Alec Baldwin find lying around in Beetleejuice. The basic premise of this book is to help new Wraith players and Storytellers alike with the setting, providing guidance for starter chronicles. Having read the jumpstart books for other lines I was expecting a condensed down version of the rules, however that is not what the book is about. It deals with content and the basic conceits of a Wraith game. That you are dead, and as a result of some driving goal or unfinished business you have returned as a wraith. You are bound to the Skinlands (wraith terminology for the land of the living) by fetters, and you are not the only wraith wandering around. Handbook deals with the first encounter a Wraith has upon awakening in the Shadowlands, being reaped by another Wraith. It provided suggestions for different types of reaping (basically, when a wraith spawns for the first time, they appear in the Shadowlands covered in a caul and need to be freed by another wraith. This is called reaping) be it at the hands of a benevolent wraith, or something more sinister. There are suggestions of how to inject some excitement and manageable peril into early games whilst new players learn exactly what it means to be a wraith and what the limits of their powers are. There is an entire chapter dedicated to playing something called a Shadowguide, which deals with the Shadow; the dark part of every wraith’s personality. There is guidance on effective building of the character of a Wraith’s Shadow as they are more than simply the moustache twirling villain version of the wraith. The Shadow wants the Wraith to fall to Oblivion, but it also wants to take as much with it as possible. This chapter is quite useful as it deals with other story elements, such as a Wraith’s shadow taunting it during play or even taking complete control for a short time and wreaking havoc. There is basic level information on various factions within the Shadowlands, as wells a bit of an overview of Stygia – one of the realms. Like I say, it is quite basic but it was nice addition and it was interesting to see that there is more to the afterlife than simply haunting thins. This title was short, easy to read and free. There were lots of good suggestions of how you might build a starter Wraith story, including how you might bring them (the party) together. There were great suggestions as to how you could create characters with aligned goals but hugely different motivations. There was just enough information supplied to provide context and overview so that when the full rulebook is published and I get it, it will be easier to read and understand. This title suffers a little bit as a result of its release order. It claims to be a guide for new players, however it assumes knowledge not provided in the book. If this had been released after the core rules, this wouldn’t be an issue at all. But, as it stands, if you read this without having read previous versions of Wraith then there are bits that are unclear. Specifically references to Shadowguides and Harrowing spring to mind. After reading the full 45 pages I came to the conclusion that a Shadowguide is a role that a player takes, playing another character’s shadow so they can taunt them in game adding to the drama, and taking some of the load from the Storyteller. This made sense, but wasn’t confirmed. I figured, from the context,that a Harrowing is something bad that happens to a wraith involving their Shadow and Spectres, but I felt some of the basic details that underpin the concept were missing. There was helpful guidance on how to run a harrowing, just nothing about what it was. A lexicon included at the start of this title would have helped a lot. To be honest, the missing Lexicon is the only major issue for me. As I said earlier, I had an expectation of a jumpstart with a cut down version of the rules as I have seen it before, however nowhere on this product does it say that this is what was on offer, so I cannot really fault it for my expectation being incorrect. But I am stuck on the Lexicon. It needed that. So, the main test. Would I use this? Wraith: The Oblivion feels like it could be a really fun game to run, both as a campaign but also as one night only games. I can definitely see me doing the latter as I really don’t have time to run a Wraith campaign. As necromancy has a good chance of cropping up in my various vampire games, I imagine I will use the core Wraith rules to build more interesting encounters, however Wraith 20: Handbook of the Recently Deceased probably wont be used in that fashion. It isn’t for that. It is a tool to help start a Wraith game, and not a tool to use to create NPCs for other games. That all being said, it was a free PDF so it is worth grabbing just for a little bit more information about the World of Darkness even if you never run Wraith yourself. I would say, as a Wraith Novice, this has whetted my appetite for the release of the full rules which will build on all of the things covered. That I am looking forward to. Wraith 20: Handbook for the Recently Deceased is available at Drive Thru RPG, which you can visit by clicking on the following banner. Disclaimer, I am an affiliate of Drive Thru RPG and if you click the banner and purchase anything, I get a small commission that helps keep this website running. All the best, happy gaming!